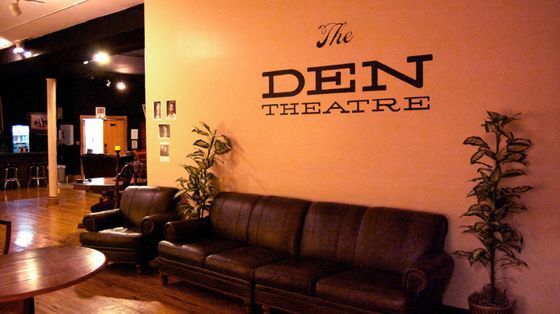 The Den Theatre's current five performance spaces on two floors at 1333 N. Milwaukee will continue to operate above the new space. The Den is now equipped with a bar and café, and a large lounge space. Future plans include marquee signage, valet parking and a nearby parking lot. Elevators to the second and third floors will make the entire building accessible. The Hypocrites' full season will anchor the venue along with an annual Den Theatre production and productions by other companies. The Den currently hosts productions by companies such as Seanachai Theatre Company, Broken Road Theatre Company, North Park University Theatre, Robot vs. Dinosaur, plus revues, one-person shows, dance performances, film screenings, classical and jazz performances, improv and stand-up, seminars and speaking engagements. Ryan Martin, The Den's artistic director, said, "This new mainstage space allows us to bring The Den Theatre's storefront aesthetic to a much larger audience while maintaining its intimacy, versatility, and creativity. Thanks to almost miraculous timing, the perfect space and the perfect partners came together! Megan Wildebour of The Hypocrites and I began talking about a venue that could accommodate their growth and creative needs. Dedicated theatre patrons Michael and Mona Heath were looking for a focused way to support the Chicago theatre community that they know and love. The perfect collaboration was born." Wildebour remembers walking by the empty clothing store at 1329 N. Milwaukee and daydreaming about turning it into a huge blackbox theater. "It felt like fate to discover that Ryan was thinking the same thing," she said. The Hypocrites have staged distinctive and creative productions in the Chopin basement studio, such as Pirates of Penzance, Six Characters in Search of Author, Coriolanus, Romeo Juliet and the recent Tennessee Williams Project. Thornton Wilder's Our Town, directed by David Cromer, transferred in 2009 to off-Broadway, then to Los Angeles and Boston. The 2011 production of Sophocles' Seven Sicknesses was Graney's adaptation of Sophocles' seven surviving texts -- Oedipus, In Trachis, In Colonus, Philoktetes, Ajax, Elektra and Antigone -- with music from Bruce Springsteen's 1980 album The River. For tickets and more information about coming productions, visit The Den Theatre and The Hypocrites.